Do you find things you like and buy multiples..
. I did more before blogging and now restrict myself to two or three of any one type and don’t do it nearly as much, prefering variety…. I just realized this is an oufit of mulitiples.. I wore the yellow one just recently Here and have it in hot pink as well. As for the cargo jogger pants, I have those in olive as well from F21.. 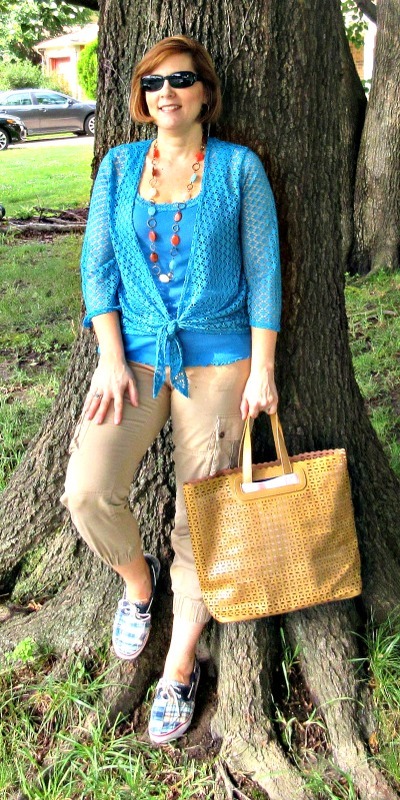 This is my second time showing the new tote from Just Fab, a purchase just for this challenge , but a great addition! Day 7’s look was all about maxi’s with a bright top.. 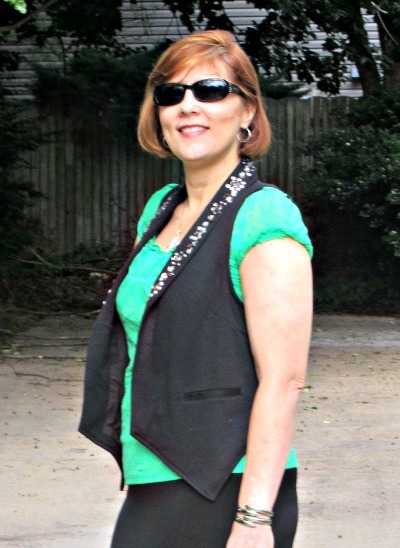 I love the green paired with this and don’t think I would have put this look together, if not for the Challenge..
My shirt and purse are both thrifted… and my skirt is actually one that converts to a dress as well , bought a few years ago.. Please Feel Free to Comment, We all love comments ! I am grateful to my children for all pitching in and helping to do a fast clean up today! I am grateful that tomorrow my niece will start coming every other week for the Summer! I am grateful for my parents for loving me and leaving me an incredible legacy! 10 Responses to "Challenge Weekend Days 6 & 7"
Those blues and greens are some of my favourite colours. You look lovely. I like both purses and would happily add them to my collection. And I have to admit: I’m sorry about your toe but I’ve been loving your shoe choices. Thank you! As a mother flats are fabulous as a petite woman, it’s nice to add wedges into some looks,especially when I have great ones! Isn’t it amazing how veraatile khaki is? It goes with SO many colors and can be dressy or casual. I love your shade of blue you chose to pair with it! I am really loving the use of khaki and the awareness of it’s versatility due to this challlenge! I love the fun casual look of your boat shoes! How perfect for summer. I absolutely buy multiples, and I used to feel a little bad about it, but I realize now that if I find something I really like, why not get it in more than one color?! Love your necklace! I haven’t been to Burlington for a while (it’s all the way across town) and I need to head back because they really do have fun, inexpensive jewelry, don’t they? Hope you have success a Burlington and find something great! Glad I’m in good company regarding multiples! I had to play catch -up, as I’ve been gone for 2 weeks! Feels OHSOGOOD to be home! 🙂 I am LOVIN’ ALL your outfits from the Style Me Challenge!! Isn’t it so much FUN?! I loved the Spring challenge & cant wait to do the Fall, as that is my very favorite time of year! I LOVE your denim vest with the striped tank/shirt- I’ll have to try that look. Today is the 1st day I have dressed even semi-stylish for 2 weeks. We were camping, so I wore a lot of tshirts. Ironically, I have on khaki capris & a bright shirt! 😉 SO looking forward to seeing the rest of your cute outfits Tracey! 🙂 How FUN! Yes the challenge is fun! Thanks, perhaps we will do the Fall one together! 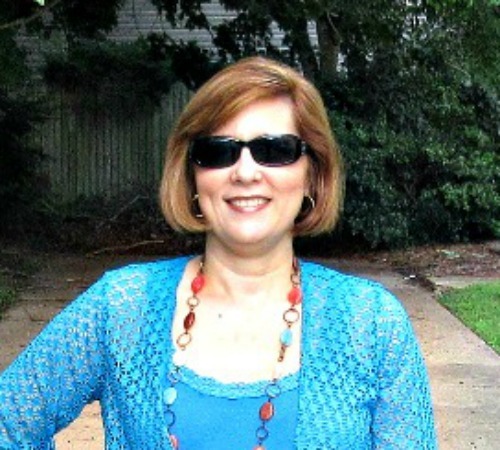 I’ve gotten so far behind in blog reading… You’ve come up with some great outfits for this challenge, Tracey. I particularly like day 3 with the striped top and sleeveless vest. Pretty colors!